Madhya Pradesh government also plans to appoint members of the third gender community to spread awareness about the ongoing cleanliness campaign in the state. A public toilet exclusively for third gender was inaugurated in Madhya Pradesh capital Bhopal on Monday to give a push to transgender rights. After Mysore, Bhopal is the second city in the country where a separate toilet has been constructed for the community. Toilets have always been a flashpoint for transgender rights. The Centre earlier this year in a circular urged all the state governments to allow members from the third-gender to use washrooms meant for both men or women in community and public toilets. 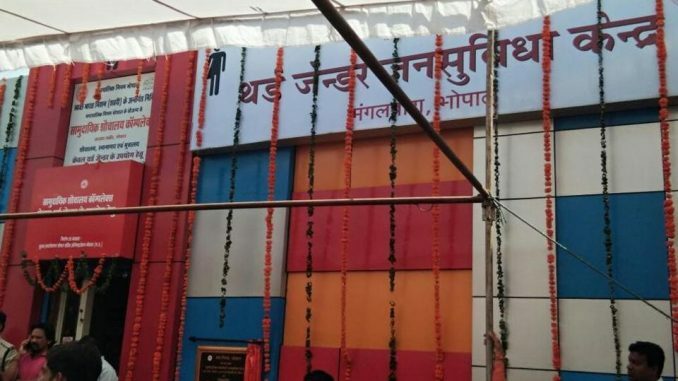 Following a 2014 Supreme Court verdict on construction of separate toilets in public places, Bhopal Municipal Corporation constructed the washroom at the cost of Rs 20 lakh in two years in Mangalwara area of the city. “Often people’s reaction create awkward situation for us while using public toilets. We are happy to finally get recognition and respect,” a member of the community, Kareena, who uses only her first name, said. “Members of the third gender have the necessary quality to inspire people. I am requesting you to develop songs to spread message of cleanliness among masses and hold campaign in rural and urban areas of the state,” the chief minister said. The state government will give honorarium for those holding cleanliness campaign, Chouhan added. Mayor Alok Sharma, who had laid the foundation stone for the public toilet, was also present on the occasion. “We are giving equal treatment and respect to third gender community. We have also sought their suggestions for smart city project and are incorporating them in the plan,” said Sharma. Apart from constructing the exclusive restroom, the MP government also announced to construct pucca houses for the people of third gender under the Pradhan Mantri Awas Yojna.